For a while last year, I got into the habit of doing “news roundup” posts every now and then and for this post I’ll make a return to that format. Most of the items below are hardly new, but I’ve been a very bad blogger for the last couple of weeks so I hope you’ll forgive the delay. You know Daredevil: End of Days? Yes, the story that has started to seem almost as elusive as Daredevil: Target #2. Unlike the case with the latter, Marvel pops in from time to time to let us know that End of Days is still in development and last week it was time again. In his weekly chat with Comic Book Resources, Marvel E-i-C Axel Alonso gave us a sneak peak at some art and passed on a message from editor Stephen Wacker that an announcement is coming soon. 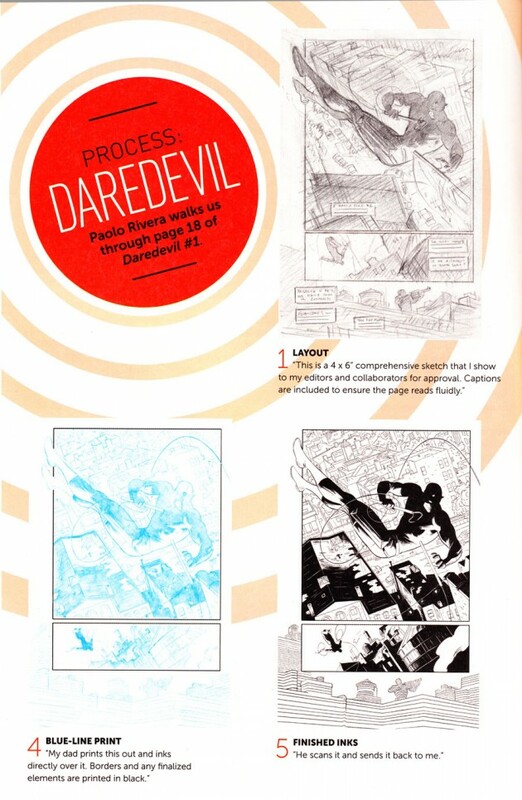 Old news by now, but August also saw the release of a Moon Knight/Daredevil/Punisher spotlight issue with interviews and “behind the scenes” stuff. 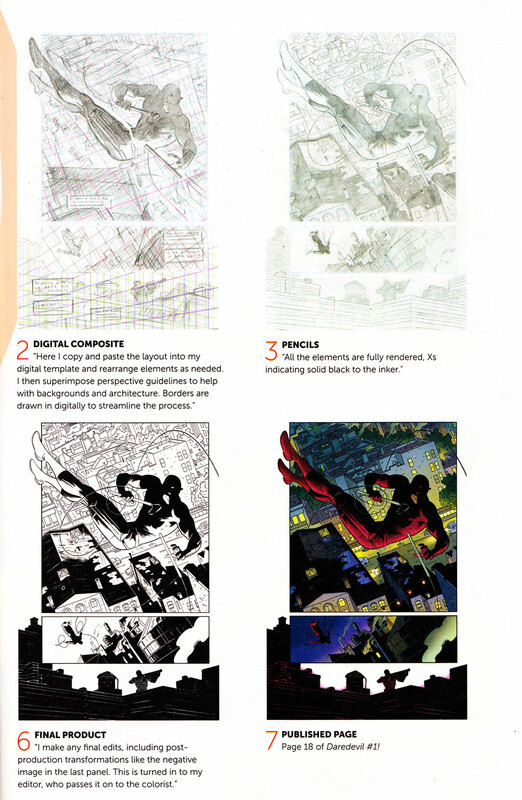 The Daredevil section included interviews with Mark Waid and Paolo Rivera, among other things and below you’ll find a spread of Rivera detailing the art process behind those lovely pages. As always, click to enlarge and click again – anywhere on the image – to close it. Earlier this week, Daredevil writer Mark Waid did an interview with Insight Radio, a radio station affiliated with the Royal National Institute of Blind People in the UK. You can listen to the full interview here and I recommend that you do since it was quite interesting (I might follow up on some of the things Waid touched on in a separate post). A bird (who knows who he is) whispered in my ear to let me know about a very neat Tumblr site devoted to the Black Widow. Check it out! not really a fan of the idea. I feel the same way. 🙁 However, I think we have to interpret the notion of “canon” pretty loosely here. Despite what Bendis has said, I find it hard to imagine how this is supposed to fit into current continuity (not to mention that Brubaker was still writing the book when Bendis said that). Besides, it’s not as if Marvel is planning to stop publishing Daredevil when they’ve decided that he’s reached the age he’s supposed to be in End of Days. This “End of Days” is probably gonna end up clashing really really badly with the current status quo of Daredevil. There is like a 95% chance this is gonna be “dark”, “gritty”, “tragic”, and straight up depressing just as Waid is adding some much needed fun to Daredevil’s world. All that said, as lots of people are saying, there is no possible way this will be recognized as “canon” in the long-term. Quesada and co. may try to sell it that way and Mr. Prima Donna himself, Bendis, can believe it, but as you say the serial nature of comics won’t allow it. This will be no more “canon” than “The Dark Knight Returns”, “Kingdom Come”, “X-Men Forever”, of any of the “End” books from Marvel.